Service Providers are competing all over the globe to deploy 5G services, soon. This article tracks the status of deployments of 5G services in various countries and cities, across the globe. Unlike 4G, the initial launch of 5G services in 2018 weren't targeted at mobile phones. The initial set of 5G use cases were targeted mostly at enterprises and businesses. In 2019, service providers started rolling out 5G based services for the mobile phones. Verizon is the world's first service provider to launch a non-standard version of 5G in four different cities in US. They launched their first 5G service called 5G Home, a residential broadband service to their customers in the following cities. The initial speeds offered by Verizon is 300 Mbps. Verizon has announced the launch of 5G services in 4 cities, so far - Indianapolis, Los Angeles, Sacramento and Houston. (Read: 4G vs. 5G). Verizon announced that they're planning to rollout a standards based 5G NR solution in 30 markets before the end of 2019. Verizon launched their standards (5G NR) based mobile services in select areas of Chicago and Minneapolis, during the first week of April 2019. They announced that the customers should expect speeds of 450 Mbps during their initial launch. AT&T launched standard mobile 5G and mobile 5G devices to 12 cities in 2018, and another 5 cities by early 2019. You can find a detailed 5G market update, including details on the cities where 5G will be launched by AT&T at AT&T 5G Evolution market. AT&T has achieved peak theoretical wireless speeds of 400 megabits per second for capable devices. AT&T is offering the commercial 5G solution to select “businesses and consumers” in 12 cities, beginning Dec. 21, 2018. They expanded the service to 7 more cities in on Apr 9th, 2019. They are using a Netgear based 5G Mobile hotspot, as part of the initial launch. Altogether, AT&T 5G services are now available in 19 cities - Las Vegas, Los Angeles, Nashville, Orlando, San Diego, San Francisco, San Jose, San Antonio, New Orleans, Houston, Jacksonville, Louisville, Dallas, Atlanta, Waco, Charlotte, Raleigh, Austin and Oklahoma City. In Feb 2019, AT&T announced its plans to launch 5G services in two more cities, by end of 2019 - Minneapolis and Chicago. Sprint announced that they'll be deploying "Mobile 5G" in 9 markets in 2019 - including Chicago, Atlanta, Dallas, Kansas City, Houston, Los Angeles, New York City, Phoenix, and Washington D.C.
U.S Cellular, a small regional wireless service provider in US announced that they'll launch 5G services in second half of 2019. It is not clear, what kind of services they are going to launch and in which geographies. 5G Observatory Quarterly Report published by the European Commission (EC) reported that the number of 5G trials by mobile operators in the 28 countries of the European Union (EU) reached 138 by mid-December 2018. EE, one of the largest service providers in UK has announced that 5G services will be turned-on in 6 cities by mid-2019. Those cities are London, Cardiff, Edinburgh, Belfast, Birmingham and Manchester. Vodafone announced in March 2019 that they've live 5G sites up and running in Bristol, Cardiff, and Liverpool. They said, they'll launch 5G services in 19 markets across the U.K this year. Vodafone Ireland announced in March 2019 that they'll launch 5G services in Ireland in Q4, 2019. The other service providers in Ireland Eir and Three Ireland have also announced that they would be launching 5G services in 2019. Deutsche Telecom (DT) launches 5G in Poland in Dec 2018 with Huawei Equipment. Their services will be available for select customers and partners. Austrian telco A1 rolled out 5G services in Gmünd, Austria, in collaboration with technology partner Nokia in 2019. The operator was able to achieve 5G speeds of up to 10 Gb/s in a 5G data call on the live network. A1 is offering 5G-based high-speed broadband services, to Gmund residents. T-Mobile Austria said it will launch 5G in 25 sites, by March 2019. T-Mobile also started a trial in Innsbruck, last year. Telia launched a pre-commercial 5G network in Helsinki in September 2018. The service provider has also turned on 5G networks in Stockholm, Sweden, and Tallinn, Estonia, for tests, by partnering with Ericsson. In March 2019, the operator announced that they are doing Fixed Wireless Access (FWA) tests with Nokia. Several service providers from Switzerland are competing with each other to launch 5G services. Swisscom said on 10th Apr 2019, that it aims to complete the nationwide expansion of its 5G network with 90% population coverage by the end of 2019. 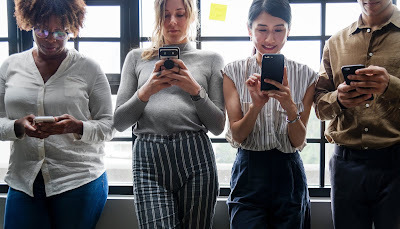 In Apr 2019, Swisscom launched the 5G network, and related services in 54 cities, including the major centers of population such as Zurich, Bern, Geneva, Basel, Lausanne and Lucerne. Swisscom has advanced its plans to launch 5G (original plan was to launch in 2020). Another service provider in Switzerland, Salt Mobile, is targeting a 5G services launch in 3Q'19. Sunrise, announced in April that its 5G network is available in 150 locations in the country. 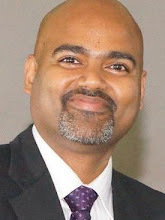 The operator is currently providing the Sunrise Internet Box 5G for fixed wireless access services, initially for users it describes as “Sunrise 5G pioneers”. Sunrise has not yet announced any plans to offer 5G for smartphones. South Korea Telecom has become the first nation in Asia to launch commercial 5G networks in Dec 2018 in Seoul and 6 other major cities. SK Telecom also started deploying 5G infrastructure in K-City, country's first city for self-driving cars, during the beginning of 2018. Multiple South Korean operators, specifically South Korean Telecom, Korean Telecom and LG U+, said in 2018 that they would launch 5G services in March 2019. However, they made an announcement in March 2019, that the launch would get delayed. On 5th April 2019, KT, SK Telecom and LG U+ announced the widespread availability of mobile 5G services. Samsung S10 5G phone is the only option available for customers to avail the 5G services. The service providers mentioned that LG V50 device will be available in a couple of weeks. 5G services in India are going to be launched as late as 2021 or in 2022. TRAI Secretary said in a recent CII event that "The telecom sector will move to 5G by 2022 and access to digital platform will become highly advanced in the next five years". Bharti Airtel, one of the prominent players in India conducted 5G trials and reportedly achieved 3 Gbps speed during the trial. 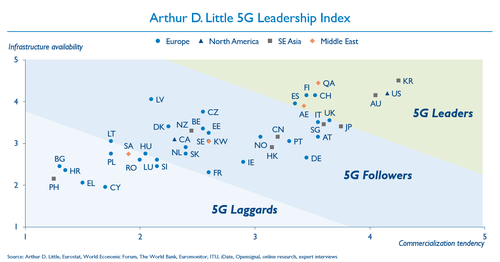 Recently, Arthur D. Little, a leading consultancy, published a "5G Leadership Index", ranking different countries based on the progress that they've made with 5G trials and deployments. Surprisingly, South Korea ranks higher in that index, even when compared to countries like USA, which is making the most noise.